Advent has arrived and so thought of designs begin to stir with the start of a new church year. There are so many topics that make excellent subject matter for Ecclesiastical Embroidery Designs. 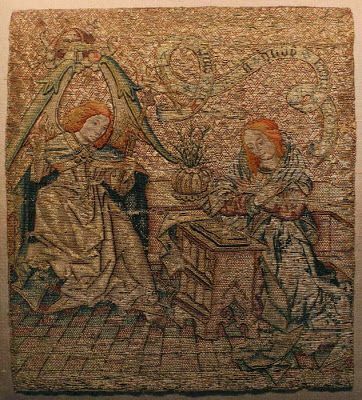 For this evening, I hope you enjoy an assortment of Embroidery designs featuring the Annunciation. 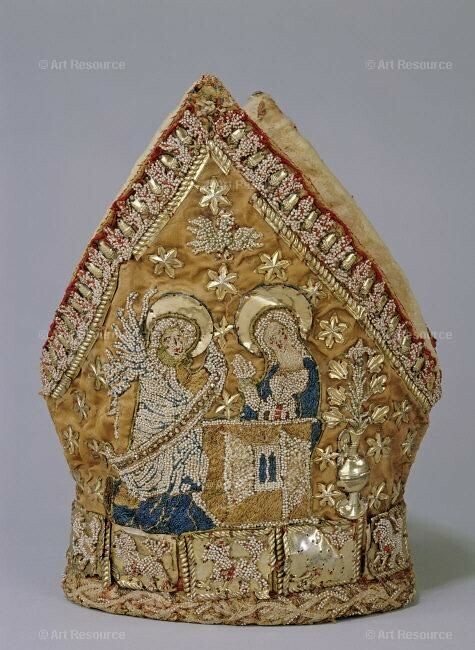 This mitre design is located on Pinterest. It features a wealth of textures created with the use of various stitches and pearls. Notice also the details of gold, including the chalice on the lower right side. This image dates from centuries ago. It reminds one of the paintings from the middle ages with rich and elaborate folds in volumes of drapes garments. 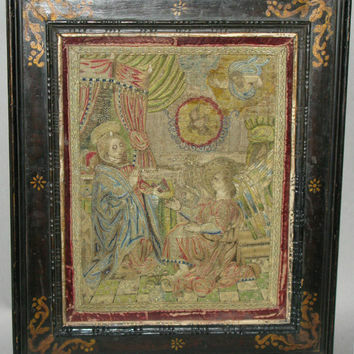 Gold work and stunning colors set this Annunciation design apart from many others. There is a lovely write up and information on this Cope Hood on Needle ‘n Thread. Other sources of design inspiration for the Annunciation can be found in countless paintings done over the centuries. Someday, this will be on my list to embroider. Until then, wishing you peace and joy during this Advent season.